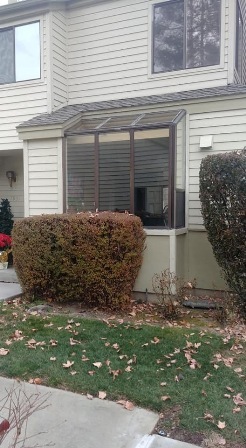 The homeowner wanted an updated look to replace this old garden window. 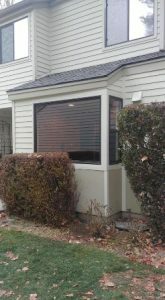 He contracted with Wood Windows Inc to take on the entire project. Wood Windows Inc is a specialty contractor and our carpenters do more than just swap our windows. 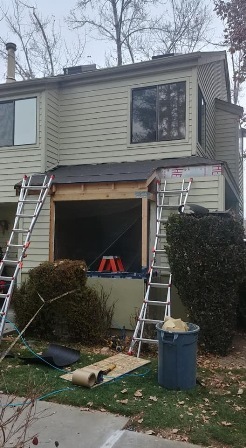 We removed the old windows and hauled them away. We rebuilt the side wall and roof line.We installed 2 Milgard Ultra windows; one picture and one single hung. Then we matched and installed roofing and siding on the new space. We trimmed it all out and cleaned up the job site with no damage to the landscaping. Why hire a window replacement contractor if they don’t complete the job for you? We guarantee our labor and give a lifetime warranty on labor for as long as you live in your home. During Demo. Still a pretty clean job site. After Vinyl Window Replacement. Milgard Windows.